The Sounding Board team from left to right: Professor Noah Smith, Maarten Sap, Ari Holtzman, Professor Mari Ostendorf, Elizabeth Clark, Hao Fang, Professor Yejin Choi and Hao Cheng. 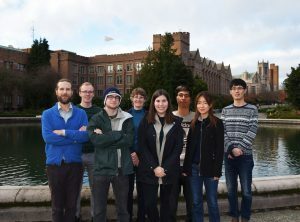 The team, made up of UW graduate students in electrical engineering and computer science, is one of three in the world to make it to the finals. The inaugural $2.5 million Amazon Alexa Prize is the first of its kind for the company, asking students from around the globe to build a “socialbot” that can have intelligent conversations with Amazon’s digital assistant, Alexa, about pop culture and news and events. The grand challenge of the Alexa Prize is to develop a socialbot with the ability to converse coherently and engagingly with humans on popular topics for 20 minutes. The team that has the highest-performing socialbot will receive the grand prize of $500,000. If the winning team also meets the 20-minute grand challenge, the team’s university will receive an additional prize of $1 million. UW Electrical Engineering (EE) graduate student Hao Fang led the effort to develop the university’s prototype – Sounding Board. When developing the bot, the team sought a design that provides user-focused content selected from a variety of sources. Applications for the Alexa Prize came in from over 100 teams across 22 countries. Sounding Board was one of 12 teams evaluated in the semifinals. The bots were evaluated based on a number of criteria, including ratings from Alexa customers and competition judges, depth and breadth of topics covered and accuracy of responses. Fang and his teammates EE graduate student Hao Cheng and graduate students Maarten Sap, Elizabeth Clark and Ariel Holtzman from the Paul G. Allen School of Computer Science & Engineering worked with lead advisor EE Professor Mari Ostendorf and Allen School Professors Yejin Choi and Noah Smith. From July 1 to August 15, the bots were evaluated in the semifinal round. Real customers interacted with the devices, prompting a conversation with “Alexa, let’s chat.” Customers rated the bots on a scale of one to five, assessing whether they would care to speak with the socialbot again. In addition to Sounding Board, three other bots were selected to move on to the final round – Alquist from Czech Technical University in Prague and What’s up, Bot, a wild card pick from Heriot-Watt University in Edinburgh, Scotland. The winning team will be announced in November at the Amazon Web Services event, AWS re:Invent. Congratulations to team Sounding Board!